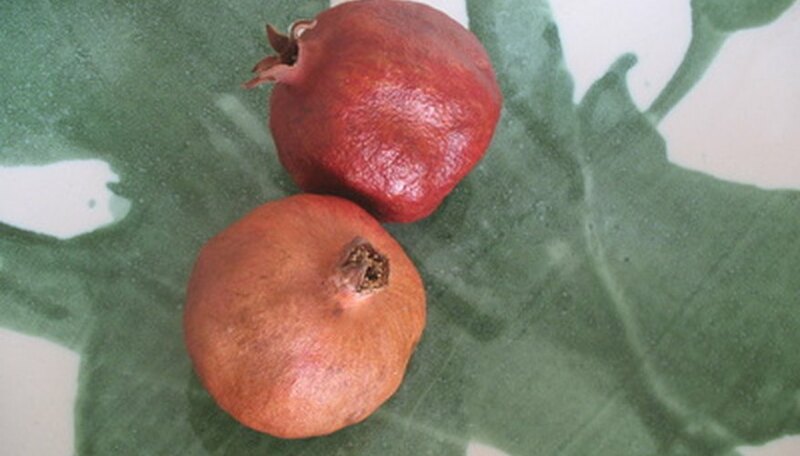 Pomegranate trees are native in parts of Iran, India and the Himalayas. They are cultivated in the United States for their fruit, which is enjoyed in whole form as well as in juice form. The trees prefer semi-arid, mild weather and do best in areas with cool winters and hot summers. The species grows in a shrub-like form, usually around 12 feet tall, but with the capability of growing up to 30 feet high. Pomegranate should be planted in the sunniest location for the best crop. If the fruit quality isn't up to par, moving a pomegranate tree may be the best option. Transplant pomegranate trees in March or October so the cooler weather will lessen the stress on the plant. Choose a planting spot with full sun. Till the soil to a depth of 1 foot to loosen it. Insert the shovel into the ground 2 feet from the pomegranate tree's trunk. Move a little farther out to ensure minimal root disruption if roots are evident. Make a wide circle around the tree, loosening the soil as you go. Grasp the main stem of the tree and pull gently to dislodge it. Lift the tree from the ground and carry to the new planting location. Dig a hole that is at least 1 foot wider and deeper than the tree's root mass. Scrape the sides of the hole with the sharp shovel edge to loosen the soil to help the roots spread. Place the tree in the center of the hole. Replace half of the removed soil, tamping it down as you go to remove air pockets. Water the soil until damp. Replace the rest of the soil and press it down. Water again until the soil is moist. Lay 1 to 2 inches of mulch around the base of tree. Water the pomegranate tree every couple of days for 10 days, keeping 1 inch of soil consistently moist. Wear gloves as protection when moving a pomegranate tree.